As the compact sedan segment of the auto industry continues to be a popular choice for a new car with so many drivers, it can be difficult to know which vehicle will be the best choice for your specific driving needs. Two of the best and most popular vehicles in the segment over the years continue to be the Nissan Sentra and Hyundai Elantra. Which new car is the best vehicle for you? This side-by-side comparison of the 2019 Nissan Sentra vs 2019 Hyundai Elantra will help show you the differences between these compact sedans so, you can make the most informed decision when it comes time for you to buy your new car. While both the new 2019 Nissan Sentra and 2019 Hyundai Elantra have a lot to offer you, one of them is a better choice. Keep reading to learn more about what each new car has to offer you. Like many compact sedans, the new 2019 Nissan Sentra and 2019 Hyundai Elantra both offer excellent fuel efficiency and spirited performance on the road. The new Nissan Sentra and Hyundai Elantra offer multiple engine options so, you can get the power you desire. This comparison between the 2019 Nissan Sentra and 2019 Hyundai Elantra also shows that each vehicle offers seating for up to five passengers and your choice of either a manual or automatic transmission. One of the biggest differences you’ll find in this 2019 Nissan Sentra vs 2019 Hyundai Elantra comparison is in each of their technology and comfort offerings. 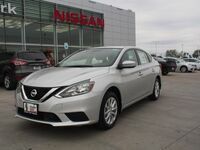 The 2019 Nissan Sentra has an amazing list of features and options to choose from that give it an advantage over the 2019 Hyundai Elantra. To learn more about the new Nissan Sentra or to schedule a test drive, stop by or give us a call at Charlie Clark Nissan in Brownsville, TX.